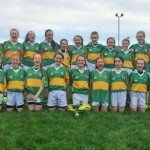 Match report – Coláiste Bhaile Chláir vs Mercy Tuam. Posted October 25, 2016 by Josette Farrell in News. On Friday the 21st of October, the U14 girls’ football team of Coláiste Bhaile Chláir took on Mercy Secondary School Tuam in Knockdoe pitch. Throw in was at 11 o clock on a frosty morning. The game set off with a trilling start by Kate Slevin, who scored the opening point in the first 5 minutes of the game. This was followed by a quick attack by the Mercy, but this was short lived when Nikki Sweeny made a great block. Shauna Brennan showed great sportsman-ship when she got back up onto her feet following a knock in the opening 10 minutes of the game. Claregalway showed no signs of slowing down when Katelynn McMahon score an excellent goal in the middle of the first half. This was followed by another point by Kate Slevin. By the end of first 30 minutes, Claregalway had an impressive start with 2 goals, thanks to Katelynn McMahon, and 4 points, 3 from Kate Slevin and one from Chellene Trill. The whistle blew again to commence the second half. Chellene Trill had a brilliant game by putting her blocking skills to good use. In the opening minutes of the second half, Kate Slevin scored her 4th point of the game. Kiara Kearney put great pressure on the opposing team to make sure they remained ahead coming towards the middle of the final half. Shauna Brennan then scored a fantastic point to put Claregalway well in the lead. In the 55th minute, Rebecca Hynes, no.15, was replaced by Alva Collins. Kate Slevin made sure she would not be forgotten as she scored another two points within minutes of each other, which brought her up to 6 points out of 8 so far. Kiara Kearney showed great defence skills as she saved a ball going straight for goal. Katelynn McMahon, who had a brilliant game scored a lovely point in the 60th minute of the game. Kiara Kearney added another point to the score board as she kicked the ball over the bar, which was followed by another, thanks to Chellene Trill. Shortly after wards, in the final few minutes, Shauna Brennan put even more scores on the board by sending the ball into the back of the net for another great goal. Finally, just to seal the deal, Katelynn McMahon got her hat trick by scoring her third goal in the final few seconds of the game. The game finished with a score of 4 – 11 to Claregalway to 4 point to Mercy Tuam, a well-deserved win for Claregalway. 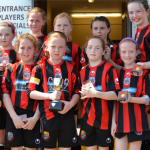 The player who shone the most was Katelynn McMahon, who scored a total of 3-01. She only began playing Gaelic football in the summer and is definitely one to watch in the future.